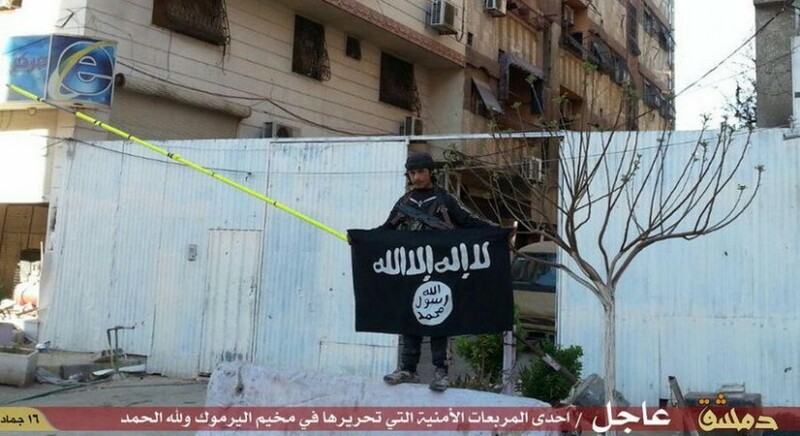 Isis has taken over 90% of Yarmouk camp, located on the outskirts of Damascus. Islamic State (Isis) militants have posted grisly pictures of beheaded Palestinians, including that of an imam, from a Palestinian refugee camp in Syria which it took control of earlier in the weekend. Initial reports by the London-based Syrian Observatory for Human Rights (SOHR) monitoring group stated Isis has taken over 90% of Yarmouk camp, located on the outskirts of Damascus. The Palestinian refugee camp on the southern edge of the Syrian capital has been the scene of a violent fight since it was entered by Isis militants earlier this week. The SOHR report noted that the Sunni extremist group has struck an unusual allegiance with its arch rival Jabhat al-Nusra, to take control of Yarmouk from rebels loyal to Palestinian faction Hamas, which had been fighting against regime troops. It is reported that at least 18,000 Palestinian refugees are trapped inside the camp. Unconfirmed reports claim that at least 21 people have been beheaded. Reports also say that several Palestinians including an imam have been beheaded by Isis. Grisly pictures posted on social media shows severed heads hung on spikes inside the refugee camps. Another image posted by @Terror_Monitor shows an alleged Isis fighter beheading a blindfolded man,while behind him at least three to four more bodies with severed heads are lying on the ground. With thousands of refugees fleeing the Yarmouk camp due to the Isis onslaught, the United Nation has expressed concern about the situation. The refugee camp which once housed between 100,000 and 150,000 Palestinians and Syrians, now holds only about 18,000. "The situation in Yarmouk is an affront to the humanity of all of us, a source of universal shame," UN Relief and Works Agency (UNRWA) spokesman Chris Gunness told Reuters.